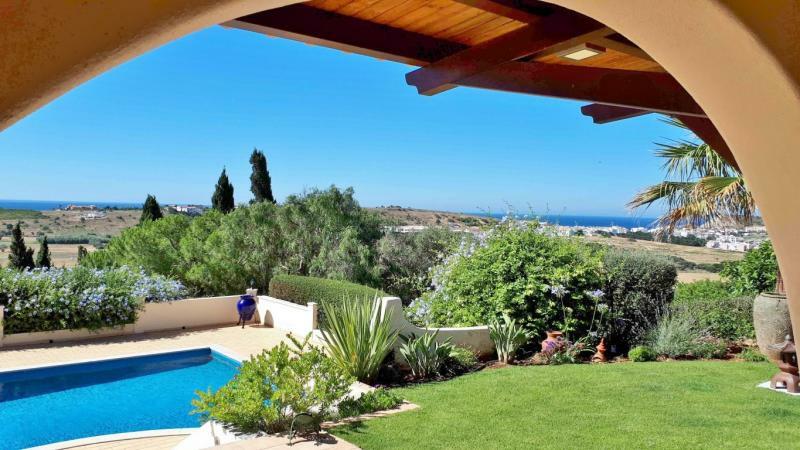 Fantastic and beautiful 4 bedroom Villa on a hilltop with great Sea views! A beautiful classic villa built with quality and designed for a comfortable living, surrounded by a mature garden with terraces and levels that welcome the access to the house, from the main gate, through a serpentine driveway that flows up to the parking area and main entrance. There is a large terrace with a heated salt water swimming pool, a barbecue and a dining covered area. The accommodation is very well maintained, spread into 2 floors, with a great flow from the entrance hall inviting to the main siting area with a closed fireplace, a separate dining room, a fully fitted kitchen with integrated appliances that opens to the dining room, an office, 2 double bedrooms with fitted wardrobes and 2 bathrooms, a laundry and service room that opens into the garages. On the top floor there is an en-suite double bedroom with fitted wardrobe and a private roof terrace, boasting great views over the sea from Luz to Burgau. Attached to the main house, on the ground floor, there is a small apartment with 1 double bedroom, a kitchenette, a single room used as a gym and a bathroom. The gas, and machine room are located in individual allocated compartments, in a side annex to the villa, that is used as a store. Included in the property there are features such as: double glazing in all windows and doors, inverted cooling and heating conditioning system, central heating connected to a Daikin air pump and solar panels, alarm and surveillance system with a video entry porter and electric remote controlled gates, LED illumination equipped throughout the property, borehole and water reservoir with level control, irrigation system, salamandra connected to the chimney and fueled with pellets.